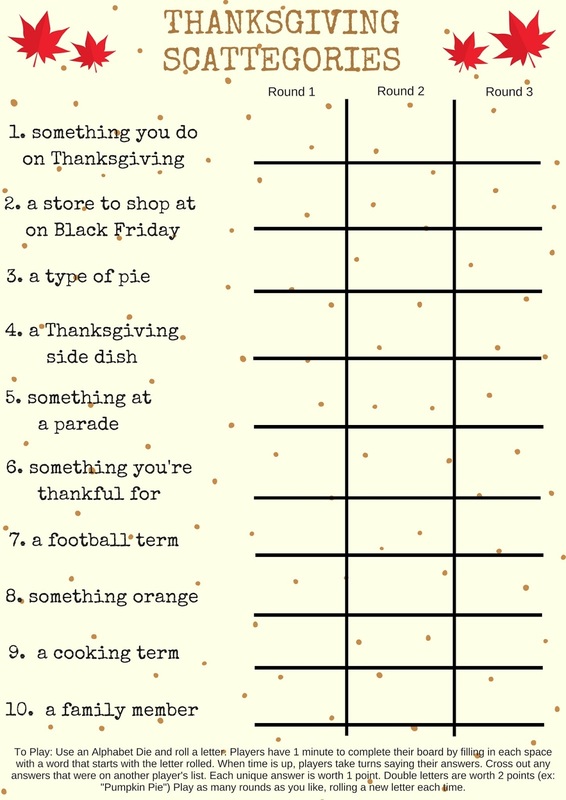 Savvy Spending: FREE Printable: Thanksgiving Scattegories Game! Print or Pin now! 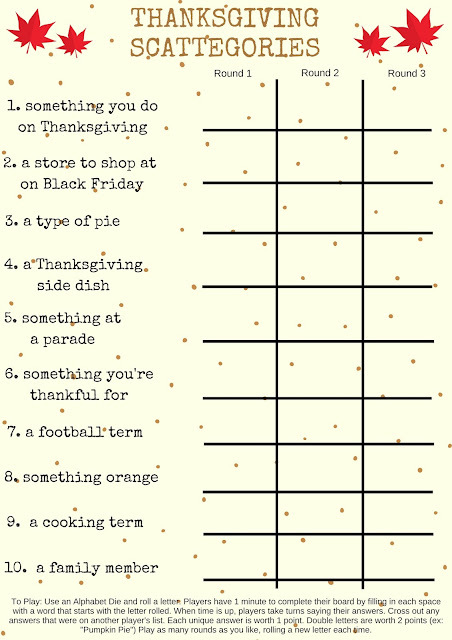 FREE Printable: Thanksgiving Scattegories Game! Print or Pin now! We like to play games at holiday dinners, especially now that some of the kiddos and cousins are getting older and can join in. We've made so many fun memories this way! Last year we played a Christmas version of Scattegories on Christmas Eve. It was hilarious! So I decided to come up with a Thanksgiving version for us to play after Thanksgiving dinner next week! If you don't know how Scattegories works, you can go here for a complete list of rules. I included a quick synopsis of the game on the bottom of the print out if you just need a refresher. Also, if you don't have an Alphabet Die, you can simply write down each letter of the alphabet on a little scrap of paper, shuffle them up, and draw a letter from there. Or, go HERE for a random letter generator and use the timer on your phone! We usually end up setting the timer at about 3 minutes, but you can adjust this time to change the level of difficulty! GO HERE TO DOWNLOAD and PRINT! Print one copy for each player! ENJOY! Please share with your friends on Social Media or Pin to Pinterest!